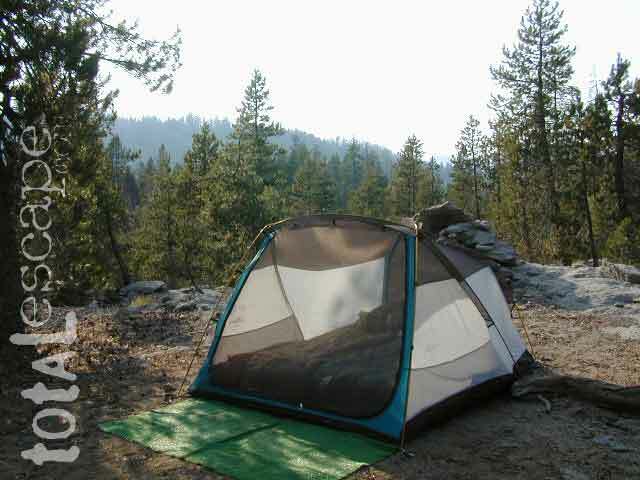 Before you can choose the ultimate place for your tent, you must decide where it is you wanna sleep OUTDOORS. What ultimate location? Your destination can play a huge factor in you getting a peaceful nights rest. And do you really need a campground? Or, are you ready to try to rough it, without the amenities? Best camping is off-the-beaten-path, and usually on the back roads. 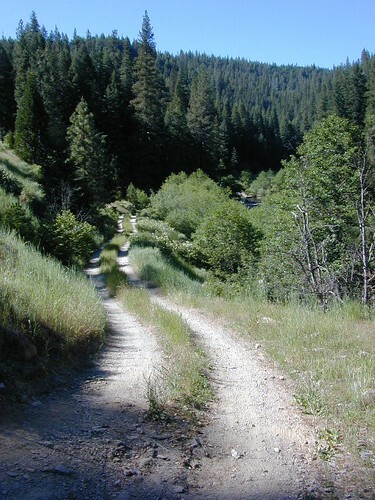 Trailhead camps, 4×4 camps, best view camps, creek camps; Dispersed camping, often called primitive camping. Focusing here on car camping, tent camping and backpacking routes. Just choosing a flat tent spot isn’t good enough anymore. You crave the best camping experience and seek real nature, with minimal crowds. No annoying neighbors, no parking hassles, no traffic or cars passing by. We at Total Escape are here to help you get to your wilderness goals and experience nature like never before. Right here, right now and it doesn’t hafta cost you a dime. Let’s start with a terrain overview. California has it all ­ – mountains, deserts, coastal, rolling oaks with rivers in the countryside, plus the infamous wine country and developed campgrounds within city limits. Desert camping in summer months should only be attempted by the experienced camper who loves 90+ temperatures. Mountain camping in winter can be freezing, so make sure you have the proper gear. Good maps are a must have and the readily available National Forest maps are your best avenue for getting and staying away from the masses. Visit our Destinations page to decide what kinda place you wanna ‘call home for the weekend’. If you are the “I don’t care where I sleep kinda guy, as long as I can do/see this many things” all crammed into a 3-day holiday weekend, then you best do your research ahead of time. Get a good map, measure the mileage, plan picnic stops and sightseeing. Plan to set camp in a central location close to the main highway to call home-base, so you can be off exploring as much as possible. Schedule in some “down time” or a full day for relaxing. Calculate driving distances and pad it w/ an extra hour. Maybe make a campground reservation if you are visiting a National Park or busy State Park. If you plan to wing it without reservation, always have plan B or plan C options already picked out. With millions of residents and tourists on the west coast, chances are you won’t be the only person wanting to do Big Sur, Yosemite or Point Reyes that particular weekend. Bring a decent Sleeping Pad. Air Mattress with the inflator pumps will be the most luxury, without sleeping directly on the hard ground. Therm A Rest sleeping pads are another fine option, for those who like to travel light and still have air underneath them. Extra blankets, always. 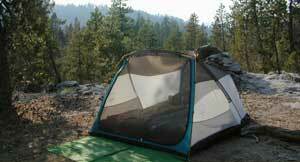 Flat & Soft ground is the goal in choosing the best tent spot. 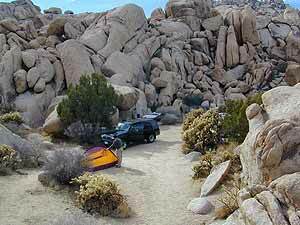 Park your vehicles over the rocky slanted ground and keep the best flat areas for your camp site. Do not pitch a tent in a meadow, no matter how inviting it looks. Wetlands and meadows are fragile ecosystems, an area that should be protected. Look at the big trees above your sleeping spot and examine them. Do not place your tent near or underneath a dead tree or a dead limb. Trees do break and fall, especially if winds pick up. This could be a life or death choice, so remember to look up. Bring abundant good tent stakes and USE them. Yellow plastic stakes are for soft cedar and sand. Thin aluminum stakes are for backpackers. Large steel nail stakes (some w/ plastic tips) are best stakes for all-around terrain. Bring a mallet to pound stakes or use big rocks to hammer them. Gloves are also a good idea! Never underestimate the use of a big tarp and some rope. Guy lines help hold a tent in place when windy weather turns to big storm. If wind is in the forecast, then do this task before you head out on your day hike away from camp. Make sure selected tent site is flat. Lay on the ground to check it out. Tents should be at least 10 feet away from your campfire. At least 100 feet away from a creek or lakeshore. Beach camping at the ocean edge; Know the high tide mark; place tent accordingly. Slot canyons are awesome, sandy, narrow washes, many with cliffs and caves. In the desert badlands these can become raging rivers w/ flash floods. When rain is heavy in the mountains many miles away, you could get flooded in the low lands. If you hear any thunder – RUN to high ground. Better off picking another camp site, than to die by a wall of water! Shade in the Desert sounds like an oxymoron, unless you find a place with high cliffs, or slot canyons. Tamarisk trees and palm canyon locations are usually an oasis of RV tourists & travelers. Hot Springs are also busy spots. Pinyon pines, juniper and over-sized manzanita can be found in higher elevation deserts above 1000′. The prime desert camping season is generally October thru March, as April can easily soar close to 90 degrees high. Some people swear by the open spaces and back road camping options, as they have more seclusion, plenty privacy and best off all, no campground fees. You might need a GPS and a high clearance SUV to reach some of these camp spots, but you will be blessed with a unique secret spot to call your own. Campgrounds come in all styles these days: From small primitive camps on a creek to the luxurious RV resorts with laundry room and showers. And then there is everything in between. This web site Total Escape specializes in FREE camping on the back roads and the smallest of campgrounds. Reservations are usually accepted at the most popular camp locations, many are wide open on weekdays and the majority of campsites overall are available on a first come, first serve basis.